Permanent Water Saving Rules (PWSRs) are a series of common sense rules that all customers supplied water by Westernport Water are obliged to follow day to day to ensure water is not wasted. These rules are set out in legislative instruments known as Permanent Water Saving Plans and are in place on a permanent and ongoing basis, even when water restrictions are not required. PWSRs aim to promote efficient and sensible use of water without significantly restricting customer choice and flexibility. They reflect the value that Victorians place on water, and the community view that water is a precious resource that should not be wasted. The new Permanent Water Saving Rules consists of five simple and easy-to remember rules, which will ensure the efficient use of water and avoid water wastage on a permanent, ongoing basis. These rules will be consistent across all of Victoria and will be implemented from December 16 2011. Hand held hoses – A hand held hose MUST be fitted with a trigger nozzle and be leak free. It can be used to wash your car and water your gardens and lawns at any time. Residential or Commercial gardens and lawns – A residential or commercial garden or lawn can be watered with a hand held hose at any time, or by means of a watering system between the hours of 6pm and 10am on any day. Public gardens, lawns and playing surfaces – A public garden or lawn area or a playing surface can be watered with a hand held hose at any time, or by means of a watering system (fitted with a rain/soil moisture sensor) between the hours of 6pm and 10am on any day. Public gardens, lawns and playing surfaces can also be watered in accordance with an approved Water Use Plan. Fountains and water features – Water cannot be used in a fountain or water feature unless the fountain or water feature recirculates the water. Pools and spas – Before filling new pools or spas with a capacity of 2000 litres or more, customers must fill out a Water Conservation Plan Application (53.51 KB) and have it approved by Westernport Water. The plan must show that the amount of water used to fill the spa has been offset by water saved around the home. New pools or spas that hold less than 2000 litres of water can be filled without a water conservation plan, and previously filled pools or spas of any size may be topped up by any means at any time. These measures do not apply to the use of recycled water, greywater or rainwater collected in a tank, provided it is not supplemented by water supplied by Westernport Water. In accordance with section 287ZC of the Water Act, Westernport Water hereby gives notice that it has made a by-law, titled Water Restriction By-law 105 pursuant to sections 171 and 160 of the Water Act 1989. Water Restriction By-law 105 is made using a Model Water Restriction By-law issued by the Minister for Water on 27 November 2011. The Water Restriction By-law 105 is made in relation to restrictions and prohibitions on the use of water that may be imposed in the Water Supply Districts of Westernport Water. prescribe classes of persons for the purpose of issuing infringement notices. 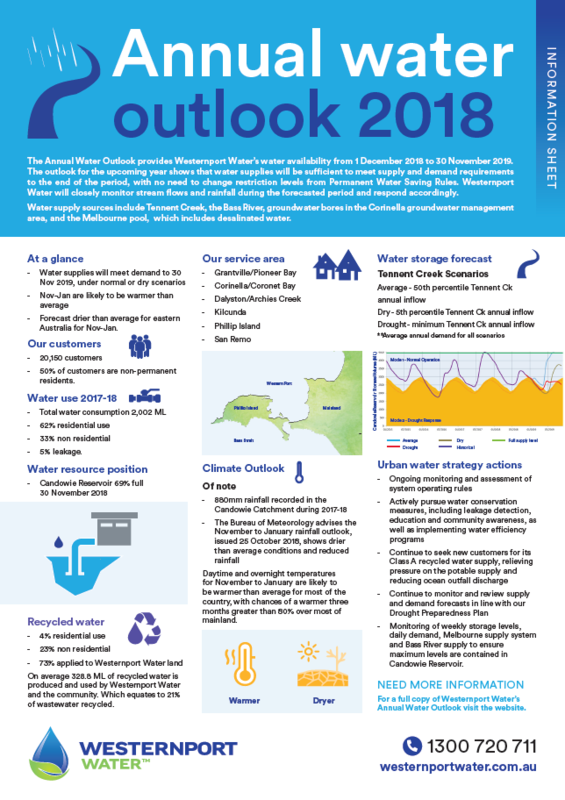 Each year Westernport Water prepares an Annual Water Outlook that uses the latest data to predict future climate, supply and demand. The Annual Water Outlook provides Westernport Water’s water availability from 1 December 2018 to 30 November 2019. The outlook for the upcoming year shows that water supplies will be sufficient to meet supply and demand requirements to the end of the period, with no need to change restriction levels from Permanent Water Saving Rules. Forecast drier than average for eastern Australia for Nov-Jan.